This week we have been focusing on the actual layout of the exhibition—including the arrangement of the display cases, the positioning of the books and information inside the cases, and the incorporation of other materials and information on the walls and around the space. To start this process, each of us came up with our own proposals, then brought them together in class to try to come up with a more cohesive plan. Although all of us brought a variety of ideas, we were able to pick out certain key ideas that we believe will be particularly helpful and successful in the exhibition. In regard to my research on Bacon’s Sylva Sylvarum, or: A Natural History, Knott 165 (Fig. 1), I have been trying to find comparisons between the four medieval beasts represented in the fore-edge painting—a basilisk, tiger, unicorn, and crocodile—with actual medieval bestiaries. A bestiary is a book that offers information about animals, both real and mythical. They provide detailed descriptions and often illustrations and were a way for people to try and understand the world around them. However, many of the illustrators of the bestiaries never even saw the animals, but instead drew from the written descriptions, which originated in texts by Greek writers, including Aristotle, Herodotus, and Aelian, the Greek Physiologus, and major Latin texts, such as the Natural History of Pliny the Elder and the Etymologiae of Isidore of Seville. 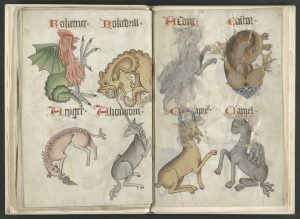 Also, most of the animals represented in the bestiaries have some religious or moral understandings associated with them, and often those moral beliefs prove to hold more importance than the actual illustrations. When trying to find comparable illustrations to those on Bacon’s book, I came across a manuscript dating from around 1500 in the Yale Center for British Art. The manuscript is from Helmingham, Suffolk and is called Helmingham Herbal and Bestiary. It provides over one hundred drawings of both plants and animals and is understood as an example of the English knowledge of natural history during the Tudor Period. As I continued reading about this manuscript, I found that it actually has a twin in the Bodleian Library, Oxford. The illustrations in both of the manuscripts show some stylistic similarities as well as present similar kinds of animals. However, although both are recognized as being made in England, Nicholas Barker, in his Two East Anglian Picture Books: A Facsimile of the Helmingham Herbal and Bestiary and Bodleian MS. Ashmole 1504, argues persuasively that the Helmingham Herbal and Bestiary is twenty years older than its twin. 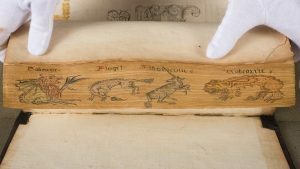 When comparing both manuscripts to the four medieval beasts on the fore-edge of Bacon’s book, I found that the illustrations, including the inscriptions of each species’ names, are almost identical. The Helmingham Herbal and Bestiary manuscript even presents the same grouping of beasts as that in the fore-edge painting with the basilisk (or cockatrice), the tiger, the unicorn, and the crocodile all shown together (Fig. 2). I am excited to have found this similarity and look forward to researching this further!